Have you ever tasted a cookie made with wine? Although not the prettiest cookie, what it lacks in physical appeal definitively makes up for in taste. It is sweet and subtle, with a crumby, fall-in-your-mouth texture – heavenly! The wine and sambuca give it an unexpected richness, as well. 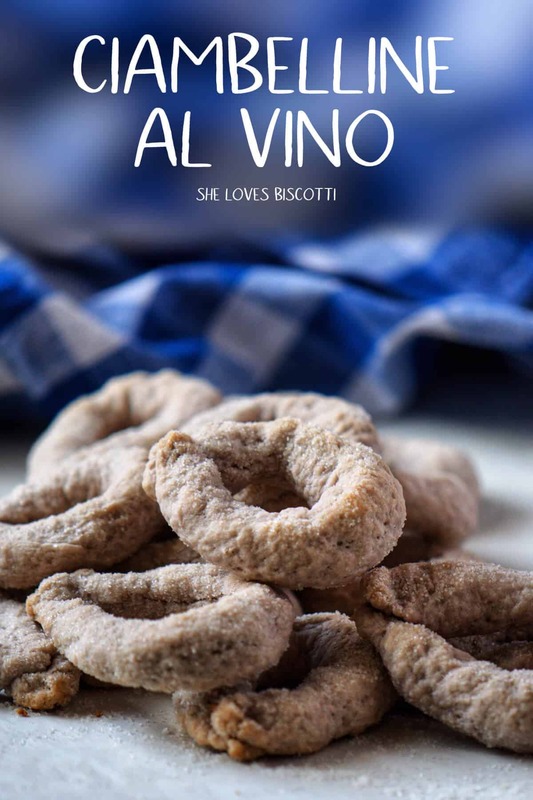 I was introduced to Italian wine cookies by a colleague of mine, who shared his mom’s Italian Wine Biscuits with me. 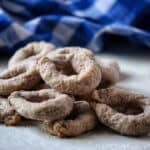 Ever since then, I have been on the lookout for more wine cookie recipes that I could add to my repertoire! 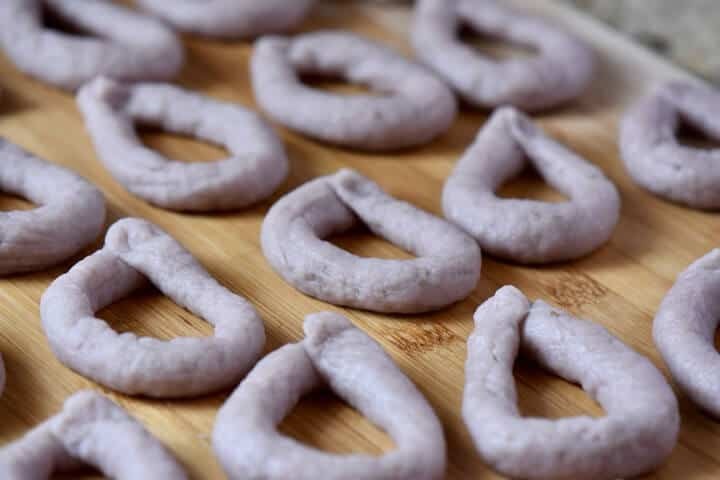 Although a stand mixer can be used to make these Ciambelline al Vino, they can easily be made in a large bowl. So the first thing we are going to do is to sift the dry ingredients together in a very large bowl. Alternatively, a whisk can be used to thoroughly combine all of the dry ingredients together. The next step is to create a well in the center of the dry ingredients; add the wet ingredients and the anise seeds. Just in case you are wondering, anise seeds (aniseed) is a spice and refers specifically to the seeds of the anise plant. When anise seeds are used in baking, they will impart a sweet and very aromatic licorice flavor. With a fork, simply begin mixing the liquid ingredients together and slowly bring in some of the dry ingredients. At one point, you can use your fingers to gently knead the dough a few times. Once the dough comes together, cover with plastic film and allow to rest at room temperature for about 30 minutes. This will allow the gluten to relax a little and will make it easier to shape the dough. Place the dough on a wooden board. There is no need to flour the board to make these cookies. Pinch off about a tablespoon of dough (approximately 20 grams). Roll each piece of dough into a 6-8 inch strand about 1/2 inch in diameter. Shape into a ring and press lightly to combine both ends together. Please note that you can make these ciambelline al vino any size you like. Lightly dip one side in a bowl filled with a couple a tablespoons of granulated sugar. Place sugar side up on parchment-lined baking sheets and bake for approximately 20 minutes or until bottoms are lightly browned. You will find that as these wine cookies cool off, they will harden -leaving you with a wonderful crispy and crumby Italian cookie. There are not enough hours in a day to truly appreciate all of the information available to us on the internet -especially when it comes to recipes. One site I have grown fond of over the years is an Australian one – I especially love their food section! The original recipe for ciambelline al vino came from that site, and can be found here. This recipe originally caught my attention because it included cocoa powder, sambuca and wine as part of the ingredients. I was very curious to see how cocoa would contribute to the overall taste of these wine cookies… unfortunately, I was disappointed with this variation. It just didn’t taste right to me. I decided to try this recipe again. This time, I changed it up by drawing some inspiration from one of my favorite food bloggers, Nicoletta, who happens to be from Rome, Italy – just like the origins of this recipe. You can find her ciambelline al vino recipe on her website: Sugar Loves Spices. Nicoletta uses anise seeds to flavor her dough, which I thought was a great idea. I am a sucker for anise, and besides, I thought it would be the perfect complement to the sambuca flavored wine cookie. This recipe was a huge hit with my family! I love it for its wonderful, expected taste and its crumbly texture. Give it a try, and I promise you won’t be disappointed! 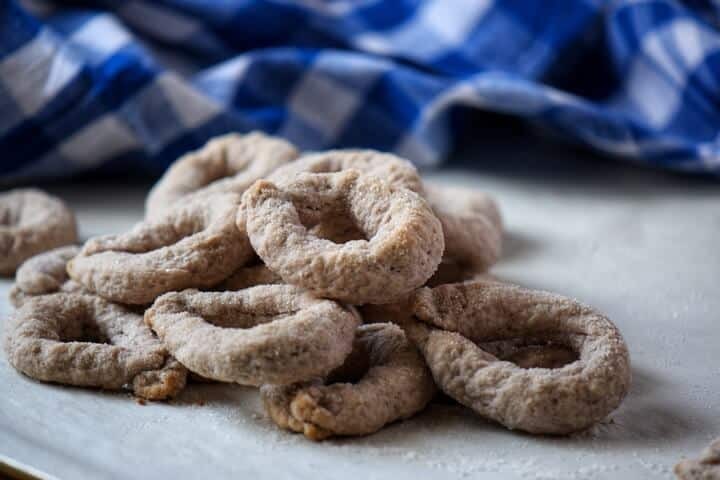 ★★★★★ If you have made these Italian Wine Cookies, I would love to hear about it in the comments below and be sure to rate the recipe! Are you looking for ways to use leftover wine? These traditional rustic looking Ciambelline al Vino are the perfect solution! 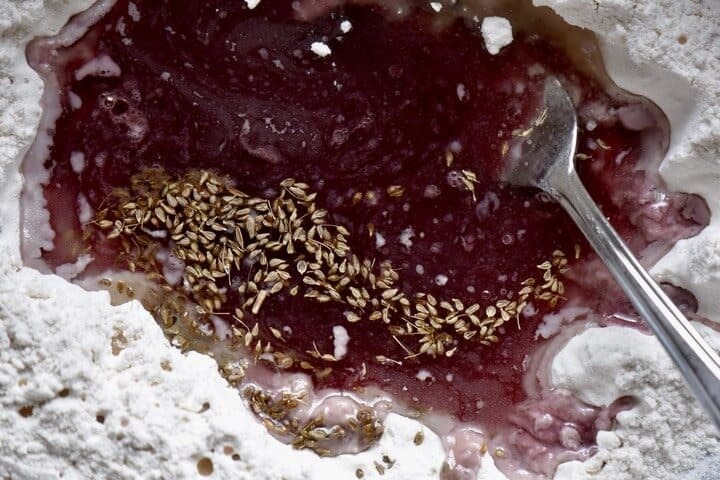 The ingredients include red wine, sambuca, flour, sugar, baking powder, anise seeds and vegetable oil. 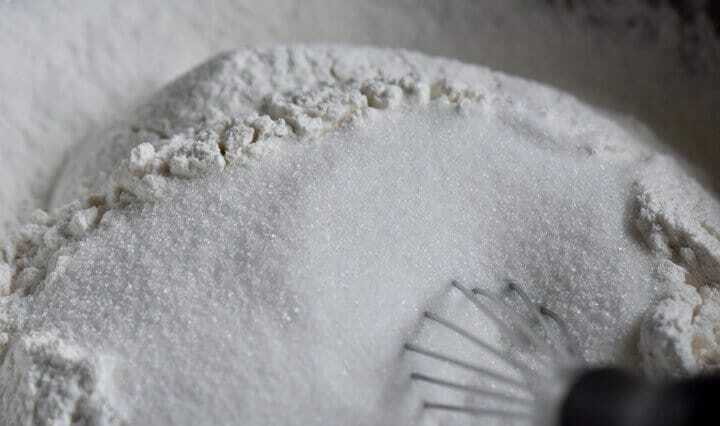 White wine can also be used to create an Italian wine cookie that has an irresistible crumbly texture. You won't believe how easy this recipe is! Preheat oven to 350°F (180°C). Place rack in the center of oven. Add the wet ingredients as well as the anise seeds. With a fork, simply begin mixing the liquid ingredients together and slowly bring in some of the dry ingredients. Gently knead the dough (with your fingertips) a few times. You will notice that the dough will no longer stick to the sides of the bowl. Once the dough comes together, cover with plastic film and allow to rest at room temperature for about 30 minutes. This will allow the gluten to relax a little and will make it easier to shape the dough. Place the dough on an un-floured wooden board. Lightly dip one side in a bowl filled with a couple a tablespoons of granulated sugar. Place sugar side up on parchment-lined baking sheets. Bake for approximately 18-20 minutes or until bottoms are lightly browned. There is an idle time of 30 minutes. I had these in a restaurant last night and they reminded me of our family’s scalledde (sp?) from Calabria…so delicious! I can’t wait to make yours. If I don’t want to use Sambuca, what other liquid could I substitute? Just more wine? Such a wonderful treat! Yes, extra wine is fine. Also grappa or any other liquor… I have also used brandy and they came out fine. Thanks for stopping by Angie.